From time to time, Google delivers a big kick in the teeth for webmasters, some say it’s fair, some say it’s not fair generally depending on whether your traffic has gone up and down when Big G changes the game a bit. Generally, SEO can be seen as a bit of a no win situation, because the techniques you have used in yesteryear are not really liked anymore and the techniques you are using now might not be liked tomorrow, let alone in a few years to come. Reading the Google Webmaster Guidelines on links is like reading a map with your eyes closed – you won’t be able to get much from it. Indeed, they use words like excessive, low quality, large scale and so on, generally words that to me mean one thing, to you, mean another. I might think that BRAND X of my favourite beer is the best thing ever, you might think its low quality, I might think drinking 2 crates a day is ok, you might say its excessive, I think spending half my wage on it is ok, you might think its large scale. You see what I mean? These words are subjective to the person and with no firm examples, who are you to tell me that something is low quality, as its your judgement, not fact. And there lies the issue with link building (and offsite SEO if we are being honest). Most of us can spot a bad link. Generally, we avoid links from dirty dancing lady websites, gambling, virus infected and all of that, but when it comes to the many millions of websites we might pick up a link from, how are we to REALLY know what is high quality, medium quality, low quality or even no quality unless we have control over every link that is ever built or we check every link in such detail that we can be sure. Anyway, that’s for another article, but what we can start to think about is the anchor text we use when building links to our site and how to make sure we don’t pick up penalties when it comes to over optimisation of our anchor text for these links. When we build links we need a website to point to, I would hope that if your reading this then you have one, else SEO might just seem a waste of time for you. But the little bit they click on is what we call the anchor text. For some, it’s a keyword, for some it might be click here, but generally, the anchor text is the word or words that are linked up for you to click on. Over the past year or so, especially since the latest releases of the Penguin updates, it is this anchor text that has caused the most problems for webmasters. The old way of building links was just to target your keywords with the anchor text. So you would end up with tons of links all with your main keywords as this text. Of course, this was then manipulated along with dodgy link building and the Spam team at Google had to find a way of dealing with this, so your link profile (which is like looking at your CV for employment) became really important to determining just how natural your links are. This meant that things had to change and more importantly, the way in which you assign anchor text to your links had to change, because otherwise you were going to get a penalty and in some case, a really big Google punch that could KO you and your site forever. Sounds serious? Well, it is, as you can see with a quick search of “Google Penguin Penalties” in, ironically enough, Google. So, when it comes to the spread of your anchor text, in my opinion, you should be looking along the lines of the pie chart below (beautiful isn’t it). Ok, so we have a pie chart and some nice colours, but what does it really mean when it comes to YOUR link building and how you should approach it. Don’t worry, we will come to that in a minute, but firstly let’s have a quick reality check and look at why this approach is necessary, rather than just glory hunting your main keywords. The main reason you will get penalised when it comes to Penguin updates (offsite and link building updates) is due to over optimisation of anchor text, which means that if you had 100 links, 90 of them had your targeted keyword as your anchor text, which from Google’s point of view just does not look like a natural link profile. Unless of course you have been doing some really dodgy stuff, most penalties that hit after the past couple of Penguin updates have been due to over optimisation and this generally meant you built a ton of links, all targeting a couple of keywords and you got caught. 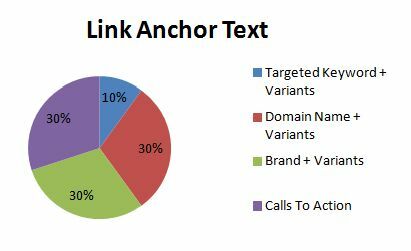 Rather than get all panicky and start hating the world and raising your fists, you simply just need to concentrate on building better links, but this time, adapting a much better and natural anchor text strategy like the pie chart shows. Even if you have a ton of links out there that are over optimised in terms of anchor text, don’t think you need to start again, you just need to blast this apart by building your future links with different and a much more varied but yet still targeted anchor text. Why do you need to do this? Well, to avoid getting hit by Big G, you need to understand that most penalties impacting incoming links are automated and not manual and whilst there are Google Spam employees issuing the bigger slaps in the face for webmasters, most have simply been picked up by their sophisticated system, which means it has looked at your link profile and seen something dodgy. And in all fairness, if you had 100 “natural” links, how many of them would really be for your keyword, probably very few if these were really “natural”. Remember, Google doesn’t really want you going out and getting links, even if by following their own guidelines you have about as much chance as ranking as I have of making a fortune from a modelling contract. It wants you to write amazing content that thousands of people are going to link to and love and share and dance around chanting your name. Sounds great yeah? But how practical is this really? Not very. So, when building links you just have to be more sensible and try to make your link profile look as natural as possible. You still need to apply the same practices of making sure the link you build is related, in a good neighbourhood and looks perfectly natural and genuine, but now you need to start thinking about the anchor text (the words you use) for the links you build and make sure that you are balanced and sensible when it comes to this. So, let’s take an example of keyboards, simply because we can. Straight away we can see that we are no longer going mad for the keywords we really, really want, instead we are looking at the bigger picture and trying to make sure that our link profile is mixed, varied and looks natural, as this is what is going to help you avoid over optimisation penalties. Even if you think you have been hit, there is no need to go and change every link you have built but just start to concentrate on building your future links with this strategy in mind, as over time it will spread your link profile. Of course, if you have been building links quickly and using one type of anchor text, maybe forget about any targeted keywords for now and just start introducing the other areas we talk about. This strategy shouldn’t change your link building process in terms of the type of links you build, as the quality, relatedness and uniqueness should all still be taken into account. But, I am simply saying that when you are building links don’t just have thousands of links all with your desired keyword, as this just looks weird and will mean you’re heading for a penalty, if you haven’t had one already. Take a look at your link profile using Ahrefs or MajesticSEO and work out how you feel Google would look at it. If you think it looks dodgy, you can be sure they will as well, so now is the time to sort things out and revise your future strategy, as a natural looking link profile is the only way you are going to be safe and sound when Big G comes calling. Shared this on the old Tweeter! Definitely agree with all this. The day and age for exact anchor text links is over. I was going to write something like this on my blog, but this really does the job. Thanks for the excellent feedback, really appreciate it. The times have changed, that is for sure, and keep doing so.